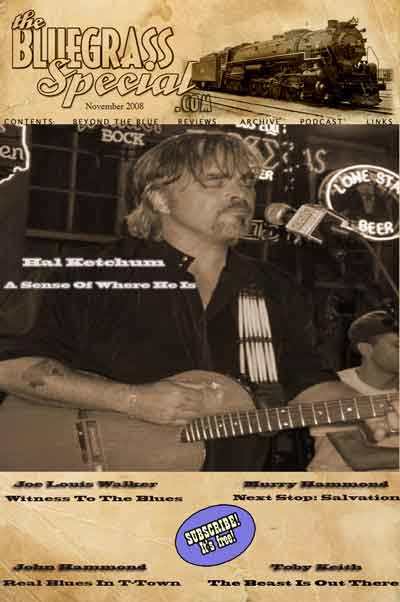 This month we’re honored to feature as our cover subject one of the finest songwriters of our time, Hal Ketchum, an in-depth interview spanning his entire career, but with a special focus on his terrific new album, Father Time, another collection of well-crafted songs about love, loss and the burden of dreams, in addition to one song saluting Christopher Walken’s memorable Saturday Night Live character, The Continental. What more could you ask? Other features this month include a profile of blues great Joe Louis Walker, who’s just released one of the best albums of his distinguished career, Witness To the Blues. And this month’s Gospel Set is provided by the Old 97s’ Murry Hammond, who’s first solo album, I Don’t Know Where I’m Going But I’m On My Way is a stark, spare chronicling of spiritual longing on a spiritual journey that winds up in a place of spiritual renewal.